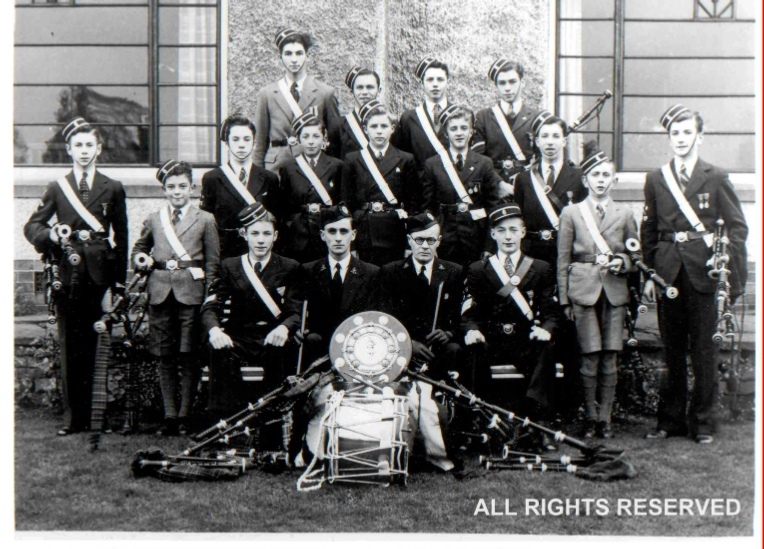 I am pleased to bring you the first part of the story of two companies of the Boys Brigade in Dundee. In the future, I will hope to give you a more full story, but for now I will let you see some of the rich history behind these organisations. The 6th B.B. began its day with a bugle band up until 1919 when Piping began. 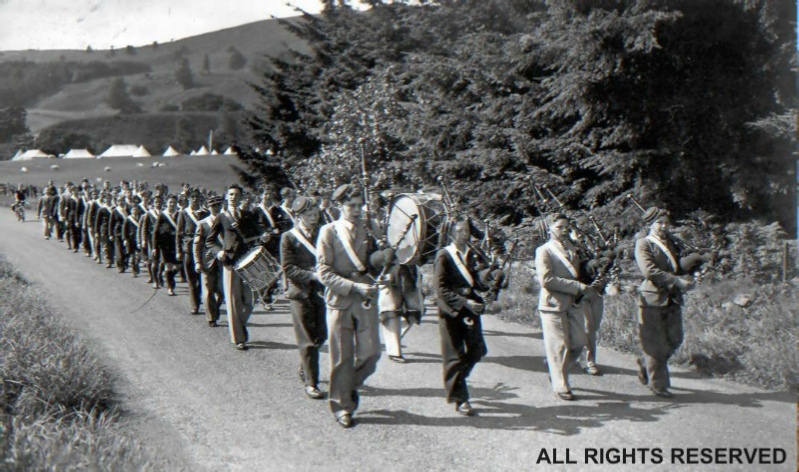 This would make the Pipe Band 94 years old in 2013. This would make that one of the oldest bands in Dundee. 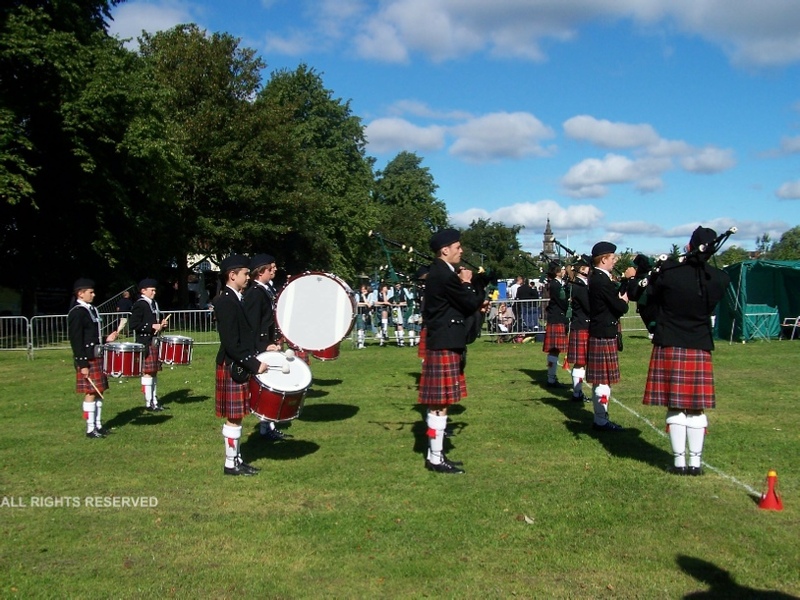 I know that The MacKenzie Pipe Band start the same year, but the Dundee Police Band (Defunct) started in 1905. I would be interested in checking out the other bands of the age group. It is with interest that you note that all three are still in existence. David Marr has supplied me with all the information he can, and has also provided me with the intriguing picture with an even more intriguing storyline. The opening picture shows us the Pipe Band of the Cossipore Regiment in India. These are ex members of the 6th B.B. 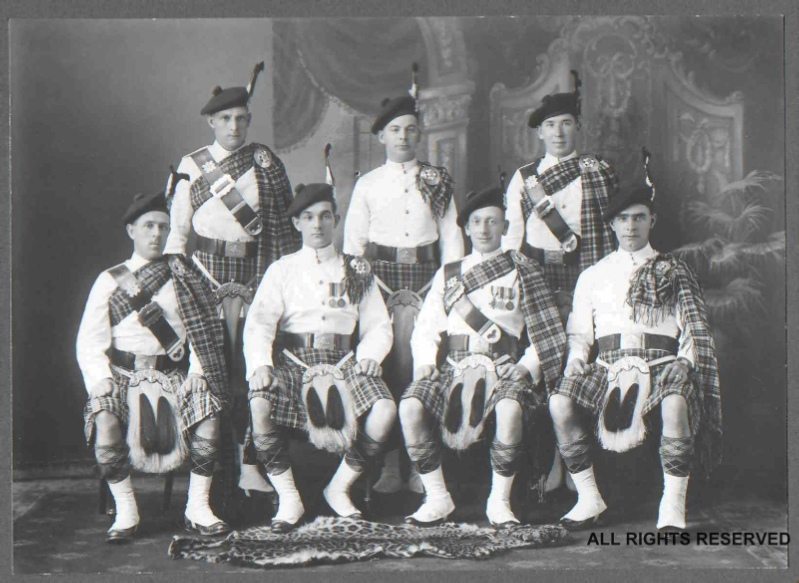 but the only name I have is that the Pipe Major (front left) is Jock Nicol. His son was also a past member of the 6th. The band wears tropical Whites and the Ogilvie Tartan. Aad Boode has been doing some research and has come up with some information about the Cossipore Regiment. -1884 IV. (Cossipore) Field Brigade. -1917 I. (Cossipore) Mobile Brigade Artillery. -1920 IV. (Cossipore) Field Brigade. The Unit was raised in 1884 and through merger in 1925 became The Bengal Artillery. Seemingly, Cossipore is a district of Kolkota (Calcutta). I could not find information about another regiment which has Cossipore in it's title. There is also a written history about the Cossipore Artillery Volunteers by Lt. Col. David A. Tyrie, published 1912." My own feeling is that these units were set up in the many Jute factories in India and Eastern Pakistan. The people in them were the "India Wallas" mainly coming from Dundee and district. Dundee being the centre for Jute manufacture, the city sent out many engineers, managers, accountants etc., to Bangladesh where Jute was grown, and also to Calcutta where many factories were set up to take advantage of cheap labour. In Dundee, I was an engineer in the jute industry and a great many of the men I trained with were engineers who had returned home after WW2. The 6th/8th B.B. 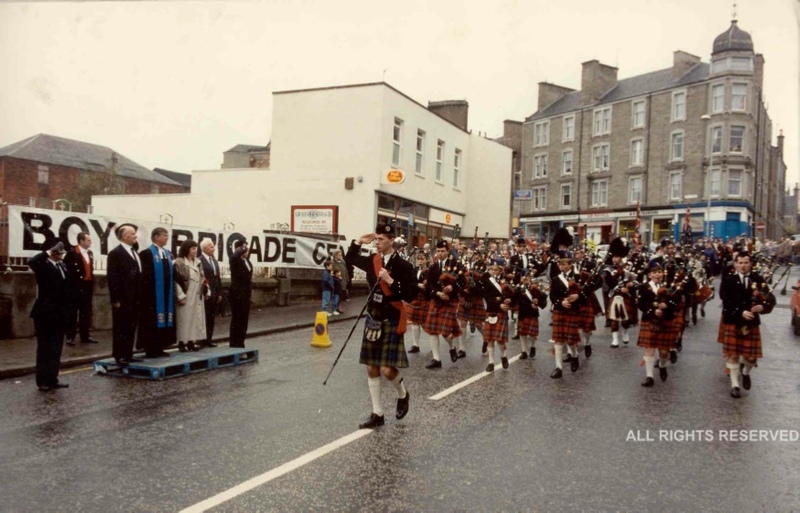 marked its centenary in 1990 with a parade to Old Lochee & St. Lukes Church. 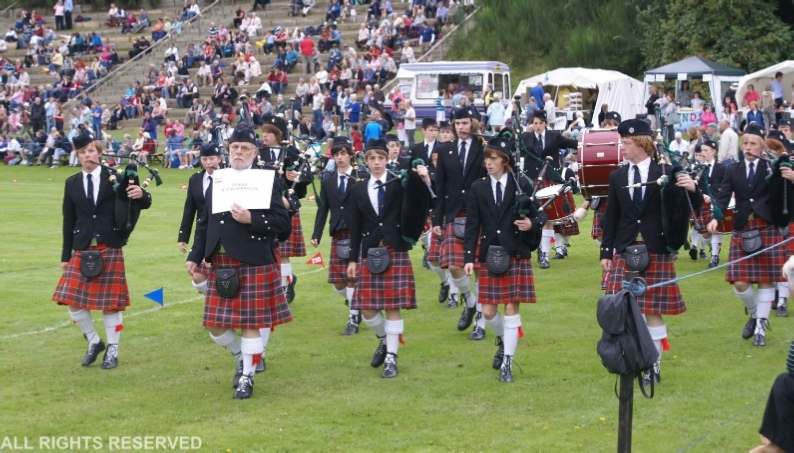 Pipe Major David Marr is completely hidden by Drum Major Derek Taylor as the band marches past the saluting dias. I suppose that is what Drum Majors are for? On the day of the parade, some of the ex members arrived for the parade, and you can see Scott Moffat and Brian Robertson in the feather bonnets, whilst elsewhere in the throng are Jacky Lockhart, Allan Paul and Angus Robertson. Now take a close look at "the midget" in the second row. 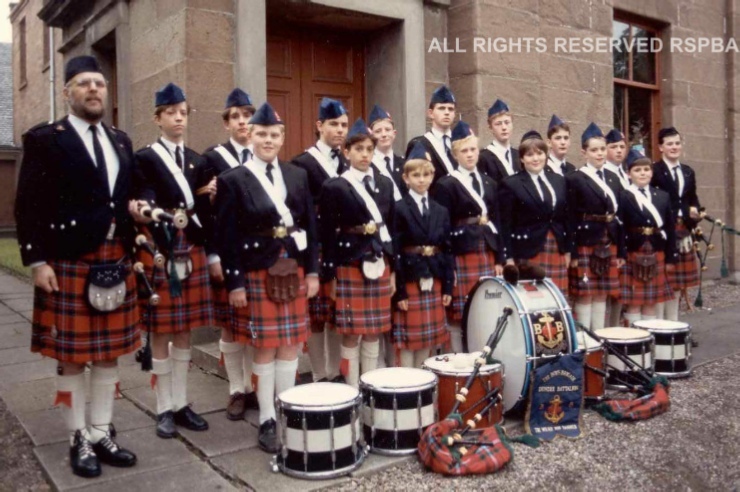 That is Andrew Wright who went on to play with the Vale of Atholl before joining up with the Black Watch.